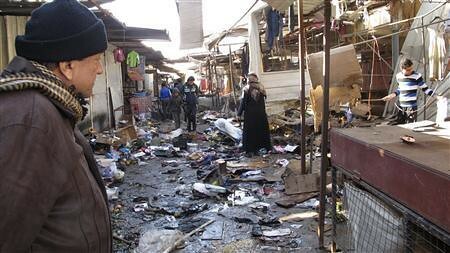 Iraqis look at damage done on Christmas Day bombings of 2013. The United States says it is sending hellfire missiles to the formerly-occupied Middle Eastern state., a photo by Pan-African News Wire File Photos on Flickr. But the counterterrorism effort the United States is undertaking with Iraq has its limits. Iraq’s foreign minister has floated the idea of having American-operated, armed Predator or Reaper drones respond to the expanding militant network. But Mr. Maliki, who is positioning himself to run for a third term as prime minister and who is sensitive to nationalist sentiment at home, has not formally requested such intervention. The idea of carrying out such drone attacks, which might prompt the question of whether the Obama administration succeeded in bringing the Iraq war to what the president has called a “responsible end,” also appears to have no support in the White House. “We have not received a formal request for U.S.-operated armed drones operating over Iraq, nor are we planning to divert armed I.S.R. over Iraq,” said Bernadette Meehan, a spokeswoman for the National Security Council, referring to intelligence, surveillance and reconnaissance missions. For now, the new lethal aid from the United States, which Iraq is buying, includes a shipment of 75 Hellfire missiles, delivered to Iraq last week. The weapons are strapped beneath the wings of small Cessna turboprop planes, and fired at militant camps with the C.I.A. secretly providing targeting assistance. Administration officials said the aid was significant because the Iraqis had virtually run out of Hellfire missiles. The Iraqi military, with no air force to speak of and limited reconnaissance of its own, has a very limited ability to locate and quickly strike Qaeda militants as they maneuver in western and northern Iraq. The combination of American-supplied Hellfire air-to-ground missiles, tactical drones and intelligence, supplied by the United States, is intended to augment that limited Iraqi ability. In an effort to buttress the Iraqi military’s abilities, the Obama administration has sought congressional approval to lease and eventually sell Apache helicopter gunships. But some lawmakers have been hesitant, fearing that they might be used by Mr. Maliki to intimidate his political opponents. A plan to lease six Apaches to the Iraqi government is now pending in the Senate. Frustrated by the United States’ reluctance to sell Apaches, the Iraqis have turned to Russia, which delivered four MI-35 attack helicopters last month and planned to provide more than two dozen more. Meanwhile, cities and towns like Mosul, Haditha and Baquba that American forces fought to control during the 2007 and 2008 surge of American troops in Iraq have been the scene of bloody Qaeda attacks. Using extortion and playing on Sunni grievances against Mr. Maliki’s Shiite-dominated government, the Qaeda affiliate is largely self-financing. One Iraqi politician, who asked not to be named to avoid retaliation, said Qaeda militants had even begun to extort money from shopkeepers in Ramadi, Anbar’s provincial capital. The brutal tactics, some experts say, may expose Al Qaeda to a Sunni backlash, much as in 2006 and 2007 when Sunni tribes aligned themselves with American forces against the Qaeda extremists. But Mr. Maliki’s failure to share power with Sunni leaders, some Iraqis say, has also provided a fertile recruiting ground. In Mosul, most of the security force members who are not from the area have left the city, and Al Qaeda controls whole sections of territory. “In the morning, we have some control, but at night, this is when we hide and the armed groups make their movements,” said an Iraqi security official, who spoke only on the condition of anonymity, out of fear of retaliation. Ayad Shaker, a police officer in Anbar, said that Al Qaeda had replenished its ranks with a series of prison breakouts, and that the group had also grown stronger because of the limited abilities of Iraqi forces, the conflict in Syria and tensions between Mr. Maliki and the Sunnis. Mr. Shaker said that three close relatives had been killed by Al Qaeda and that he had been wounded by bombs the group had planted. Yasir Ghazi contributed reporting from Baghdad, Thom Shanker from Washington and an employee of The New York Times from Mosul, Iraq.